Set within expansive garden grounds, this truly imposing 'period' detached villa is distinguished by the size and proportions of its apartments and is one of the finest examples to grace the open market in recent years. Situated within a most sought after and admired local address, this property, in truly walk-in condition, has been totally refurbished in the last 10 years by the fastidious owners into a stylish and functional family home. With its sumptuous interior, 'period' features and hand-crafted oak finishes in the reception hallway this spectacular property is sure to impress all who view. The property's broad ranging specification includes - hand-crafted oak finishes in the reception hallway which include feature wall panelling, staircase, doors and skirtings, all 4 bedrooms now incorporate en-suite facilities, parquet flooring, marble features, 'bespoke' hand-made dining kitchen, feature fireplaces, new roof tiling, re-plumbed and re-wired, up-graded double glazing and a new gas central heating system. Externally, the gardens to the front incorporate lawned areas incorporating raised flower-beds and bushes and a mono-bloc drive-in-out driveway which leads to a detached tandem garage. The rear garden is enclosed with lawned areas, paved terrace and raised timber deck which enjoys a high degree of privacy ideal for 'Al Fresco' dining during the summer months. The impressive, traditionally proportioned accommodation extends to - entrance vestibule, broad and welcoming oak panelled hallway which leads to all lower apartments, formal drawing room with front facing bay window formation and original 'Minster' fireplace, formal dining room with French doors which lead out to the rear gardens, also with a bay window and marble feature fireplace, sitting room with fireplace and bay window, 'bespoke' handmade dining kitchen which incorporates a centre island with Granite work-top surfaces with integrated appliances to include - oven, hob, microwave, American style fridge/freezer and dishwasher. French doors from the kitchen provide access to the rear gardens. The rear hallway gives access to the functional utility room. Finally, on the lower level there is a cloaks/WC. Upstairs to the master bedroom with fitted furniture and luxury 4-piece en-suite with oak parquet flooring, marble surfaces and wood panelling with Burr Oak finishes, French doors provide access to a balcony with space for table and chairs. Three further spacious double bedrooms all of which benefit from en-suite facilities and one with a walk-in dressing room. Two valuable storage cupboards are located on the upper landing, one of which houses a staircase/ladder which leads to the floored and lined attic. Whitecraigs has a local golf, tennis and bowling clubs and is within catchment for East Renfrewshire's highly reputable primary and secondary schooling. The property is less than half a mile from the private Belmont House School and is within easy reach of various pick-up points for Glasgow's private schools which include - Hutcheson's Grammer, Glasgow and Kelvinside Academies, The High School of Glasgow, Craigholme School for girls and St. Aloysius College. The neighbouring suburbs of Giffnock, Newton Mearns and Clarkston provide a wide selection of shops, 'The Avenue', restaurants, bars, coffee shops, health care facilities, banks, bus and rail services, Eastwood Theatre, swimming pool, Parklands Country Club, Greens Leisure Club and several golf courses. 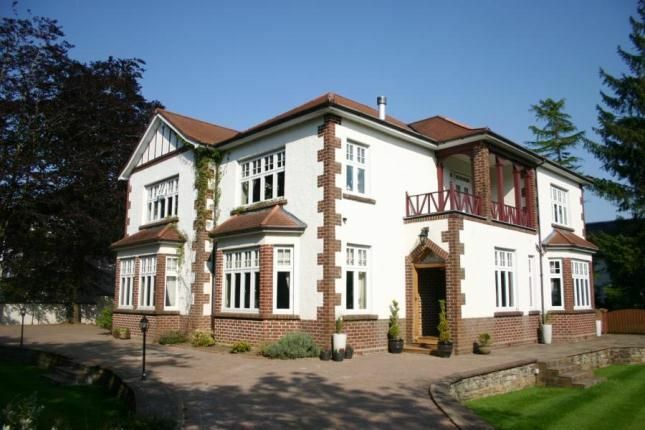 • This truly imposing 'period' detached villa, is one of the finest examples to grace the open market in recent years. Accom - ent. Vestibule, oak panelled hallway, formal drawing room, sitting room, formal dining room, bespoke fully integrated dining kitchen, rear hallway, utility room, cloaks/WC, 4 double bedrooms (all with en-suite facilities). Gas c.h. D.glaz. Drive-in-drive-out driveway. Tandem detached garage. Balcony. Landscaped gardens. Reception hallway28'6" x 12'8" (8.69m x 3.86m). Drawing room25'5" x 17'7" (7.75m x 5.36m). Dining room20' x 14'9" (6.1m x 4.5m). Sitting room18'6" x 18'6" (5.64m x 5.64m). Dining kitchen24'1" x 14'9" (7.34m x 4.5m). Rear hallway9'4" x 7'4" (2.84m x 2.24m). Utility room7'8" x 5'7" (2.34m x 1.7m). Master bedrom17'8" (5.38m) x 15'3" (4.65m) (excluding wardrobes). En-suite12'5" x 11'1" (3.78m x 3.38m). Bedroom 212'5" x 11'1" (3.78m x 3.38m). En-suite 25'8" x 4' (1.73m x 1.22m). Bedroom 317'8" x 14'9" (5.38m x 4.5m). En-suite 35'4" x 5'2" (1.63m x 1.57m). Bedroom 417'7" x 14'8" (5.36m x 4.47m). En-suite 49'7" x 6'2" (2.92m x 1.88m).